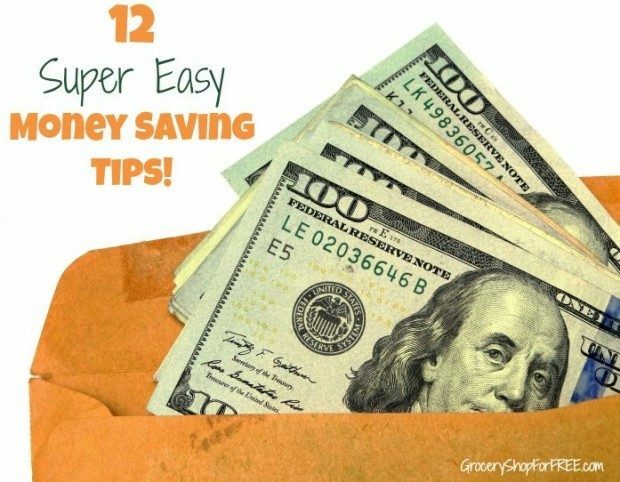 12 Super Easy Money Saving Tips! You are here: Home / Finance / 12 Super Easy Money Saving Tips! There are always ways to save more money. You can cut out bills, change plans, eat home more often, use less, reuse more. Lots of things. 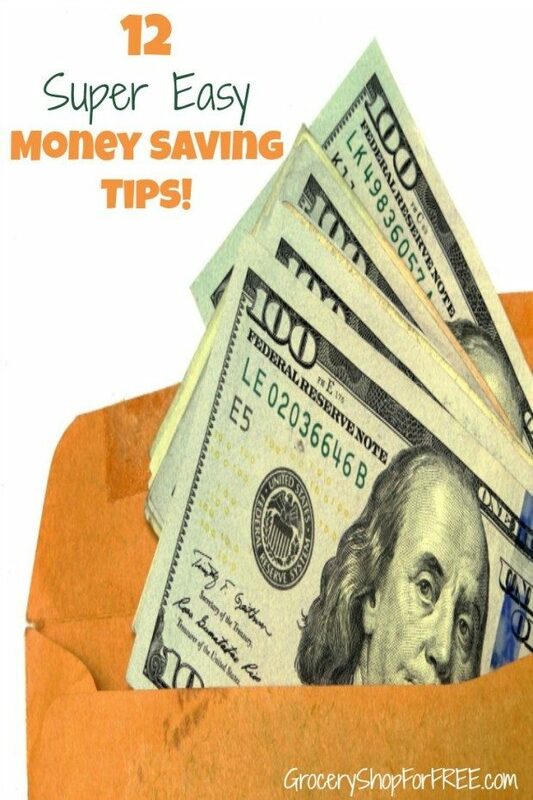 Here are 12 Super Easy Money Saving Tips I thought I would share with you today! Buy your meat in bulk. Find out when your store marks their meat down. We call it the “cheap meat section” and generally on the same day each week they go through and fill that section up with meat that needs to be purchased and either eaten or frozen right away. We buy most of our meat from that section. We buy as much as we can and we separate it and freeze it in portions we’ll need for each meal. If you have a dog (not sure if you can do this with cats) – Supplement their food. Dog food can be expensive. Our dog Molly has a sensitive stomach and we have to spend a little more on food that won’t upset her stomach (not pet store specialty food sensitive, just a little sensitive). So, while her food costs a little more than the cheapest out there, we always use coupons and catch sales, but we also supplement. My Vet told me it’s good for dogs to have vegetables and that some people even cook for their dogs. I don’t go that far :), but we eat healthy, so I make sure to mix in some of what we have with her dog food. I am not talking about frozen pizza and fish sticks, I mean potatoes, carrots, green beans and so on, she loves it and it’s good for her according to my Vet! Now, I know there are many uses for leftover coffee filters, but one way I save is to reuse them. I can’t see just using them one time, I rinse them off and reuse them until they get worn out. I have done this for years and I don’t think anything about it anymore. I know they don’t cost a lot, but every little bit counts! Buy your shampoo and conditioner in bulk. I buy gallon bottles of shampoo and conditioner at the beauty supply. When you go to the salon it’s the same shampoo they use on you. I fill the bottles half with shampoo and half with water and mix – per the instructions. I don’t dilute the conditioner. But, with a big family it lasts a long time and you’re not spending a ton on expensive small bottles of shampoos and conditioners. Keep coupons in the car. I have a notebook with photo paper in it that I keep in the car. I put restaurant coupons, oil change, tuneup, and hair salon coupons it to be used when we are out and about. I HATE being out and deciding to go somewhere knowing I have a coupon at home for it! Use your recycling bin instead of your trash bags. I used to fight the whole idea of recycling. Now, I see a value in getting a lot of the trash out of the trash can and into a recycling bin and how much that saves me in trash bags! I can fill up a huge recycling bin to almost overflowing each week and even if I broke all of the boxes and stuff down small that would take up more room in the trash bag. Milk cartons, juice bottles/boxes, cans, jars, all sorts of things that take up a ton of room! So really use your recycling bin to its fullest and save money on your trash bags (they are so expensive anyway). This one is pretty self explanatory. It’s not hard, you can learn to coupon in no time and save thousands for your family every year. Learn how to meal plan. Planning your meals and strategizing your shopping trips will not only save you money it will save your sanity! No more “what am I gonna cook for dinner”, or “I forgot to defrost anything” (that was one I said all the time). Once you learn how to meal plan, you’ll never want to go back, you’ll wonder how you ever survived before! There are a TON of great apps to help you save money. There are rebate apps that give you cash back from buying everyday necessities like milk! Most stores and restaurants have apps, too and they often have special sales or coupons just for users of their app, here are my favorite money saving apps. Mayo <— Click here to learn how. I love to make my own mayo, it takes me a couple of minutes, I know what’s in it, it’s super fresh, it’s cheaper than store bought and tastes great! P;us, when you run out it takes seconds to make more! Butter <— Click here to learn how. Again, I love making my own butter – first of all, who doesn’t love real butter? But, it’s expensive! You can make it in just a few minutes and know just what’s in it. See what FREE special services your favorite stores offer. Most stores offer their customers FREE services, from tours, to special cuts of meat, to recipes for preparing what you purchased and much more! Here’s a list of 10 Little Known FREE Grocery Store Services. Make sure to read your bills each time you receive them, in detail, to make sure you aren’t charged for something new. You can find out more about How To Save Money On Your Bills NOW! <—Here. Everyone has their own money saving tips, so please share yours with us and we can all benefit! I buy a years worth of butter, 50 lbs at Christmas for 2.00-2.50 a lb and freeze. I don’t pay 4.00+ every week. I would never eat margarine. I didn’t like the idea of work to throw away the trash. You had to sort paper and plastics and then you had to wash out cans and cartons. I just didn’t like the whole idea. But now, it’s not that way, it all goes in the same bin and I don’t have to “wash” it before I throw it away.